You can search the records in Discovery, our catalogue, by filling in the form below. You do not need to fill out every field to search these records. Each recommendation provides a detailed summary of the action or deed carried out by the person who earned the award. For some records the date will refer to the date of announcement in the London Gazette; for others it refers to the date of the action or deed which earned the award. The Victoria Cross (VC) is the highest award available to the armed forces for gallantry in action with the enemy. All ranks are eligible. The George Cross (GC) is the highest civilian award for gallantry. It may be awarded to members of the armed forces, irrespective of rank, for acts of gallantry other than in action with the enemy (for example, bomb disposal, rescue from minefields and so on). The three classes, Knight Grand Cross (GCB), Knight Commander (KCB) and Companion (CB) were available to recognise outstanding services by senior officers, generally major-general or above. The five classes, Knight Grand Cross (GBE), Knight Commander (KBE), Commander (CBE), Officer (OBE) and Member (MBE) are awarded for meritorious service. A number of awards of OBE and MBE were made for gallantry ‘not in the face of the enemy’ (for example, bomb disposal and so on) and ranked below the George Medal. The Distinguished Service Order (DSO) was awarded to commissioned officers for distinguished service, normally in positions of command but also, and much less frequently, for individual acts of gallantry. Awarded for gallantry in battle displayed by members of the Indian Army. The Indian Distinguished Service Medal is awarded to Indian citizens in the forces for distinguished service. Available in two classes, Member (RRC) and Associate (ARRC) and is restricted to the Nursing Services of the armed forces. Award of the RRC is to more senior officers. The Military Cross (MC) was awarded to officers for acts of gallantry during active operations against the enemy on land. In 1931 the award was extended to Royal Air Force personnel for gallantry on the ground. The Distinguished Flying Cross (DFC) may be awarded to all ranks for courage or devotion to duty while flying in active service against the enemy. Awarded to warrant and non-commissioned ranks for gallantry in action against the enemy. Awarded to the Governor’s Commissioned Officers, Non-Commissioned Officers and other ranks of the Burma military, frontier and military police forces for acts of personal bravery in peace or on active service. The George Medal (GM) is the second highest civilian award for gallantry, ranking below the George Cross. It may be awarded to members of the armed forces, irrespective of rank, for acts of gallantry other than in action with the enemy (for example, bomb disposal). The Military Medal (MM) was awarded to warrant and non-commissioned ranks for gallantry in action against the enemy. It ranked below the Distinguished Conduct Medal. The British Empire Medal (BEM) was awarded to ranks below warrant officer for the same services as OBE and MBE. Commanders-in-Chief in the field submitted periodical lists of officers and soldiers who were ‘mentioned in despatches’. Award of a Mention ranked below MC or MM and could be for gallantry in action or for a wide range of services on and off the battlefield. Since the Second World War a significant number of British Army personnel have been granted an award for gallantry or meritorious service by a foreign nation. Many of these awards were for service alongside foreign troops or for service in places where there was little military presence. The easiest way to search for such records is to do so by the name of recipient only. 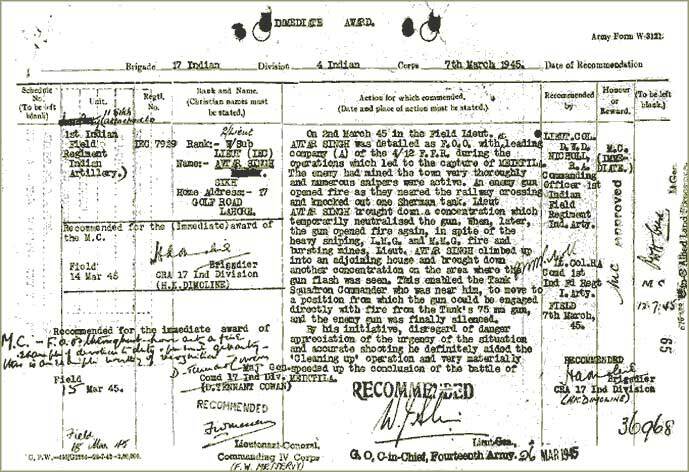 Avtar Singh was recommended for the Military Cross. This was approved and details were published in the London Gazette of 13 July 1945. See Avtar Singh’s recommendation below. Very often you will find the army form ‘W3121’, although other forms were also used. The ‘miscellaneous images’ associated with each piece do not contain recommendations, but are related material. They appear to be paperwork created as part of the administrative process associated with awarding honours. Only a few recommendations for Mentions in Despatches and the Most Honourable Order of the Bath have survived. Prior to 1979 only the Victoria Cross and George Cross or a Mention in Despatches could be awarded posthumously. A very small number of recommendations for honours and awards might not be found under a search by the name. It was not possible to index all of the series by name, because the original documents are quite complex. If you can’t find an entry here, you may want to browse the entire series of recommendations for honours and awards (WO 373) by date order. You should also be aware that in some cases the record will consist only of listings. This is where the person did not receive the award or the details of the circumstances have not survived (these particular documents may be downloaded free of charge).